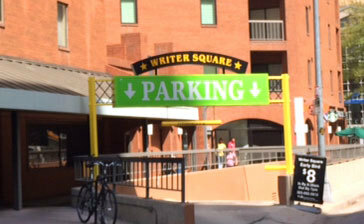 Welcome to Writer Square, Denver's premier 24/7 underground parking facility located in heart of the LoDo district. Conveniently located near popular businesses and restaurants, Writer Square is within walking distance to Larimer Square and Coors Field. Located on the 16th Street Mall, you are a quick FREE shuttle ride away from Denver attractions such as historic Union Station, Colorado Convention Center and the Denver Pavilions. Get Driving Directions to Parking Location. Get Walking Directions from Parking Location to Event. Upon arrival, look for the circular equipment with the red flashing scanner. Scan your barcode at the scanner and you will be let in. Even if the sign says the garage is full, we have saved a space for you! When ready to exit, GO TO THE RIGHT EXIT LANE and scan your barcode permit on the red light scanner in that lane and you will be let out. THERE IS NO SCANNER IN THE LEFT LANE. Please note... early entry and overage fees will apply if you park outside your reservation period. Pre-purchased credentials are good for the dates and times as listed above. Any overstay related to parking is subject to additional fees. Cancellations must be received 24 hours before the "start time". To cancel, email your cancellation request along with your receipt to WriterParking@AlphaParkCo.com. Credentials are valid for a single entry and exit unless noted otherwise and are not transferable to another time or location as rates are negotiated per location. Unauthorized duplication may result in non-admittance to facility. To check the status of your reservation, please log-in at https://secure.parkonect.com - this is for registered users of Parkonect only. If you purchased without creating an account, please email WriterParking@AlphaParkCo.com.